Facebook is always changing how they do things and it can be hard to keep up your page! We complied 5 quick facts that can help you make sure your page is exactly how you want it to be. Last September, Facebook rolled out the ability to mention someone in your status update. To mention someone, type the “@” in the status bar and start typing in their name (as it appears on Facebook), then click on the name you want to include in you status, finish your update and “Wa-la”! The name will appear blue, it’s actually a hyper-link, so that someone can click on the person’s name and be directed to their profile page. Hint: You can also tag pages, brands, events and companies! What a great way to generate conversation and awareness….. This can be important, especially for business pages, and not a lot of people know about this hidden gem. You can moderate words, including profanity, so certain words won’t show up if you don’t want them to. Go to “Edit” at the top right hand corner. In “Moderation Blocklist” you have the ability to type in words (separated by commas) that can be blocked from appearing on your wall. Underneath you can also set your “Profanity Blocklist” options. You can choose either “None”, “Medium” or “Strong”. Maybe you don’t want everyone to see what you’re up to, or what picture album is visible (like Grandma, does she really need to know about last weekend?). Facebook has a tool for that (of course.) 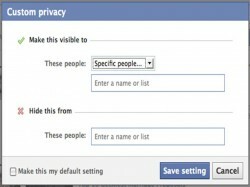 You have the ability to “hide” your status updates from certain people and choose who gets to see what pictures, so not everyone knows what you’re doing at all times. Just below the “What’s on your mind” box on your wall, click the padlock icon and a drop box menu will appear. Then you select “customize” and then decide who gets to see what! When creating an album, you have the same ability to click on the padlock icon and customize who gets to view the pictures. This can be confusing….Under the “Manage Permissions” section for your page, you can choose “Country Restrictions”. We have found that businesses have typed in “USA” thinking that they are only allowing people from the US to view the page, but then are disappointed to know that if a user clicks on your “Facebook” link on your website, they then aren’t able to actually see the page, but have to log into Facebook and then continue to find your page. This is because Facebook can only determine what country a person is from after the user logs in. 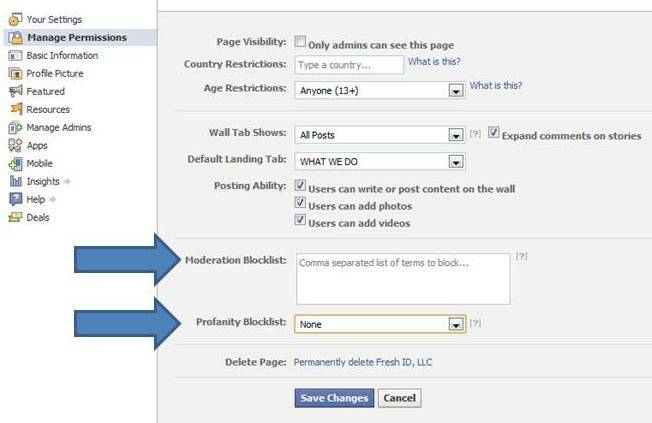 This can be frustrating, so we recommend to not listing any country for restriction, so then people can go directly from your website, to your Facebook page without having to sign in and get distracted by whatever else is on their wall. We also recommend clicking the “What is this” to get more information to fully make your decision. You must pay attention to your business page daily. To develop any actual relationships for your business, you must be consistent with your interaction and constantly update, talk and engage with your followers. In order to see any real results, make sure you are actively taking charge of your page and making it a fun, interactive environment fans want to come to. Here are some businesses we think do a swell job at paying attention to their page…. So, here are some quick 5 tips for you, and hope that you can use them and find them helpful. Great post….always good to have simple and very informative tips! I love, “Facebook is like a puppy.” Nice analogy.